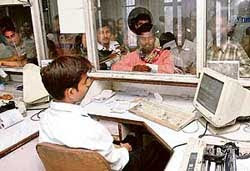 Indian Railways' Passenger Reservation System (PRS) facility was launched at four post offices in Maharashtra Circle on Monday. The facility was inaugurated by Mr Gurudas Kamat, Minister of State for Communications & IT, in Mumbai. This initiative forms part of the memorandum of understanding signed between India Post and Indian Railways for providing PRS to nearly 5,000 post offices in cities and towns across the country. Mr Kamat said on the occasion that the project would not only reduce the queues at railway reservation centres but also reduce the load on railways. The Minister also said that the PRS facility will be launched in six more post offices in the circle within a fortnight. In Maharashtra and Goa Circle, 500 post offices have been identified for the purpose. Once fully implemented, 103 post offices in Mumbai will provide railway reservation facility. “The PRS facility at the post offices will not only provide convenience to passengers in booking tickets, but will also help India Post to generate additional revenue,” said Mr M.S. Bali, Chief Post Master General (Maharashtra & Goa). The revenues will flow in the form of minimal charges levied on booking and cancellation of tickets. For example, a fee of Rs 15 per ticket will be charged for issuing second class sleeper and second class sitting tickets. Four post offices where PRS facility began on Monday include Chembur Head Post Office, Dadar Head Post Office, Mandvi Post Office, Girgaon Mukhya Dak Ghar.